~ Keep a Safe Distance  Do not chase, closely approach, surround, swim with, or attempt to touch humpback whales. ~ Follow federal regulations that prohibit approaching (by any means) within 100 yards (90 m) when on or in the water, and 1,000 feet (300 m) when operating an aircraft. These regulations apply to all ocean users throughout the Hawaiian Islands. 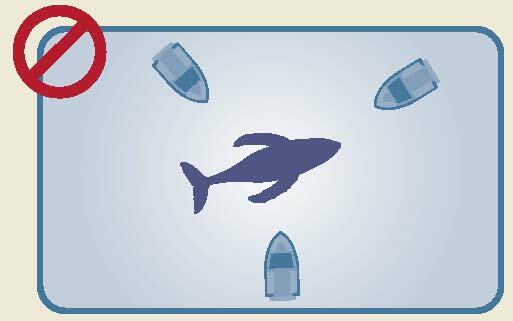 ~ Keep a Sharp Lookout  Vessel operators should always stay vigilant for whales and other collision hazards. Look out ahead for “blows” (puffs of mist), dorsal fins, tails, etc. Operators are further advised to post at least one dedicated whale lookout, in addition to the operator, from November through May. ~ Watch Your Speed - NOAA recommends that vessels travel at a slow, safe speed in areas where a whale strike may occur. This speed depends on vessel type, time of day, sea conditions, and other factors that affect whale detection and avoidance. Research shows that collisions occurring at vessel speeds above 10 knots cause more whale deaths and serious injuries than collisions occurring at slower speeds. ~ Stay at the Helm  Keep hands on the wheel and throttle at all times, and be ready to take action immediately to avoid a whale in your path. ~ Keep Your Distance  Once whales are sighted, stay more than 100 yards away. ~ Stop Immediately if within 100 yards or less of a humpback whale. Leave engines running, out of gear (in neutral) until the whale moves away. ~ Go Around Whales from Behind, while maintaining more than 100 yards distance, if you encounter whales in your path. Do not attempt to run out in front of whales to get past them. ~ Warn Other Vessels  Use appropriate VHF radio protocol or other means to alert other vessels that may not be aware of whales in their path. ~ Don’t Assume Whales See You or will get out of the way. Calves are especially vulnerable since they are curious and may not have learned to be cautious of vessels. ~ Plan Ahead for Delays in transit due to whale encounters; avoid nighttime operations if possible. ~ Call the NOAA Hotline if involved in a collision: 1-888-256-9840 - If a phone call is not possible, hail the US Coast Guard on VHF channel 16. Viewing from the side: Carefully approach and parallel the whale, remaining more than 100 yards away. If approaching from the rear, maneuver far out and to the side of the whale, before carefully viewing as above. While viewing, match the speed of the slowest whale and follow all other guidelines and regulations. Approaching head-on: Never approach a whale head-on or in the path of the animal. 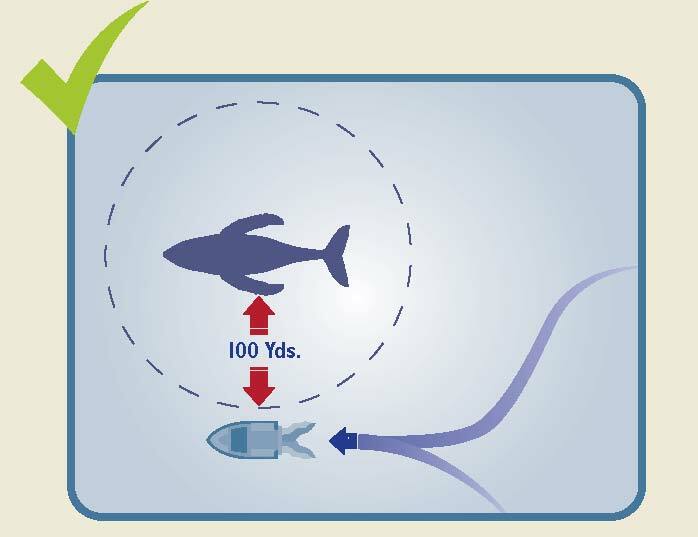 If a vessel finds itself in the path of the whale, it should safely maneuver out of the path of the animal, while maintaining a distance of more than 100 yards. Cutting a whale off from deep water. Running in front or cutting across a whale’s path. Placing your vessel between a mother and calf. ~ Bring along binoculars and telephoto lenses to assure good views and photographs. ~ While passengers may scan in all directions for whales, the vessel operator should always follow the collision avoidance guidelines. ~ Once whales are sighted, slowly approach and carefully parallel along side, while maintaining more than 100 yards distance. ~ Never operate your vessel faster than the slowest whale in the group while paralleling. ~ Never approach whales head-on. ~ Never encircle, entrap, herd, or separate whales, especially mothers and calves. ~ Never “leapfrog” or cut in front of a whale’s path. ~ Minimize sudden, unnecessary maneuvers or speed changes in the vicinity of whales. ~ Limit your observing time to 1/2 hour or less. ~ When several vessels are in the area, communicate with the other vessel operators to ensure that you do not cause disturbance. ~ Please be aware that cumulative impacts may also occur. You and your vessel may not be the only one that day to have approached the same animals. ~ When leaving the viewing area, slowly and vigilantly steer your vessel away  there may be other unseen whales nearby. ~ Dispose of trash and vessel waste responsibly. ~ Rapid changes in swimming direction or speed. ~ Escape tactics such as prolonged diving, underwater exhalation, underwater course changes, or rapid swimming away from your location at the surface. ~ Female attempting to shield calf with her body or by her movements. ~ Sudden stop in important breeding, nursing, feeding or resting activities after your arrival. ~ Abandonment of previously frequented areas.